You've found the “U.S. English Leicester Sheep Breeders” page here at Hobby Farm Wisdom! If this is the first time you have visited our site: Welcome! 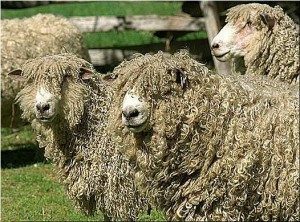 English Leicester sheep were developed by Robert Bakewell in the 1700s in England. They have now been developed to gain weight quickly and to grow fast. The English Leicester has been used to improve many sheep breeds because of its meaty carcass and heavy fleece. It is one of the few truly pure breeds. Their face is generally wedge shaped, covered in white hairs and can appear to have a blue tinge. They have strong shoulders and leveled with the back, which is flat.